Sorry - this item is out of stock. Anticipated availability Sept 24 2018. 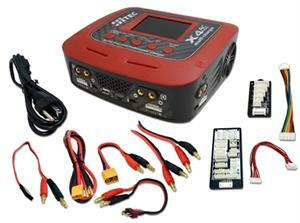 HiTEC X4AC PRO: NEW, UPGRADED & IMPROVED - REPLACES THE X4AC Plus (which was discontinued). The X4AC PRO is a 4 channel programmable professional charger system - 4 Separate Charging Channels - Quickly & safely charge up to 4 packs at the same time! Up to 200 Watts output in AC mode, and up to 300 Watts in DC mode ! Fully loaded with accessories for charging battery packs; For Li-PO, Li-FE, Li-ION, Ni-MH, Ni-Cd, Pb batteries; Charge range: 1.2v thru 30 volt. SMART & SAFE; Charges/Discharges/Conditions/Analyzes - all fully programmable. The digitalized screen enables you to observe all 4 channels at the same time. Additional features include "Charge Master" software, providing the unprecedented ability to operate your charger via personal computer, plus a built-in Bluetooth for Smartphone app operation. Has Built-in AC-DC Power Supply for use from a wall outlet at home; it also has heavy-duty DC clamps for operation from a 12VDC power supply (battery, regulated powersupply); charges Motor batteries, receiver batteries, transmitter batteries, battery cells, etc. Includes Balance connector multi-adapters for Li-PO/Li-ION/Li-FE batteries. Comes in handsome factory package. Mfg pricing effective 5-2018. One of the BEST CHARGER SYSTEMS AVAILABLE !! 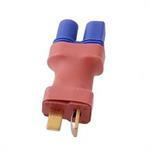 Transmitter Charge Plug - for most SPEkTRUM & JR PROPO transmitters. 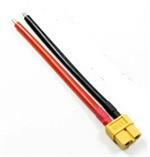 5mm x 2.1mm coax barrel plug with wire leads - use with Wall Charger or Smart Charger (when applicable). XT60 connector set - 1 battery end and 1 motor-charger end. XT60 connector set - 1 battery end and 1 motor-charger end. For high-amp RC use. Include Gold-plated bullet connectors for soldering onto. DF-4.0B : Adapter to convert battery pack with 4.0mm bullet connectors to red T connector (ultra). MCX-JSTWM: adapter for 1S 3.7v LiPO batteries. 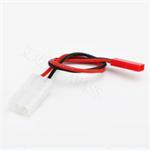 Use with small 1S 3.7v LiPO batteries for charging, or to convert connector to JST flat white style. SPEkF-JRM: Adapter to convert SPEkTRUM white connector to JR male connector. Hand for converting battery packs with SPEkTRUM white "A" connector to JR male (universal) connector. DM-EC3M: adapter to convert red "T" connector to EC3 battery end. One end has red ultra "T" male connector; other end has EC3 (blue) battery connector end. HXT-DF: adapter to convert 4mm bullet to ultra red "T" battery end. JSTW-JSTRM: adapter to convert JST white to JST red. JSTW-JSTRM: adapter for RC batteries & chargers. One end is JST white flat female connector, other end is JST red male connector. Good for adapting 1S batteries & charger connections. EC3M-DF: adapter for converting EC3 to red "T" deans style connector. Connect this adapter to a battery with an EC3 connector, and it converts it to a deans style red "T" power connector. Length: 2.75".